When I first read May's topic I immediately thought about General Conference and incorporating the talks into the lessons. Here is the link to the April 2014 General Conference talks. As I was reading over the intro to the topic, I thought about the family home evening I did with my family before conference. Some of the focus of that family home evening was on receiving personal revelation and how to prepare ourselves. Here is a link to the Family Home Evening outline, it could easily be fine-tuned into a Sunday lesson: Preparing to Get the Most Out of General Conference. An idea might be the first Sunday of the month to introduce the topic of why we need prophets and how we receive personal revelation. Give each of the class members the paper, "Receiving Personal Revelation" (see printable below). Have them think about a question they have or something they are struggling with. Have them write it down on the question line. 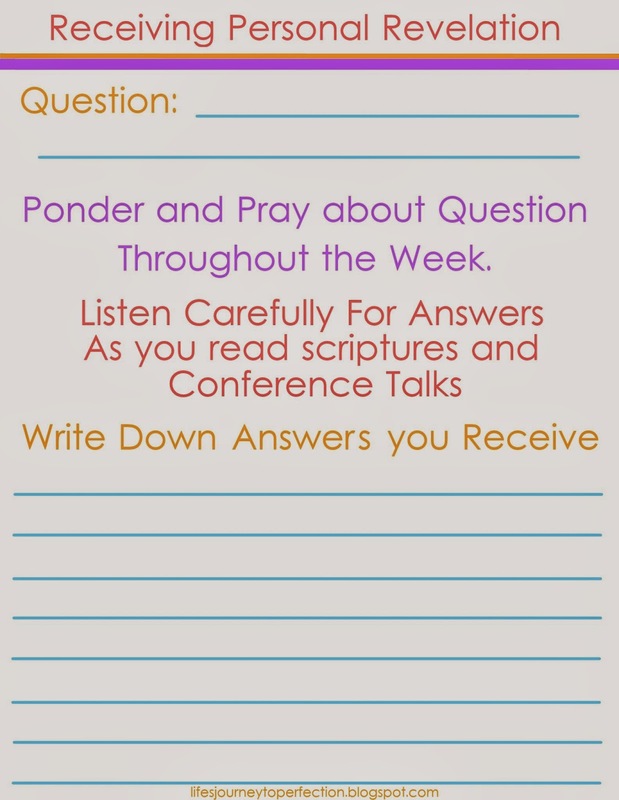 Then have them throughout the week ponder and pray about that question. A great idea that the bishop of our ward has instructed our youth and ward members, is to in the morning open the scriptures (I do the Book of Mormon) to a random page and pick a random verse. Read that verse (I read a couple verses ahead and a couple verses after the random verse) and then ponder the instruction given and how you might apply it in your life that day. I have been amazed since doing this, I have found that I receive answers to my prayers and get a little bit more out of the scriptures by being able to apply them into my life. As they are pondering, praying, reading their scriptures and conference articles seeking answers to a specific question or concern, I testify they will receive an answer. Have them write their answer down on the paper. Follow-up with them the following week. Ask if anyone would like to share their experience and/or bear their testimony. Set up an obstacle coarse, partner up the youth. Have one of the youth blindfolded. The other youth will direct the blindfolded youth through the obstacle course by voice alone. At different areas of the coarse have different noises or commotion. After everyone has a chance to participate. Discuss how important it is to tune into that voice that is their to give us direction. Explain that we live in a world that is distracting and full of commotion, that it is necessary to do the things that will help us listen to the direction given to us through the scriptures, by living prophets, church leaders, parents and through personal revelation from our Heavenly Father. Another idea would be to have a special fireside where the Stake Patriarch is invited to speak about Patriarchal Blessings.